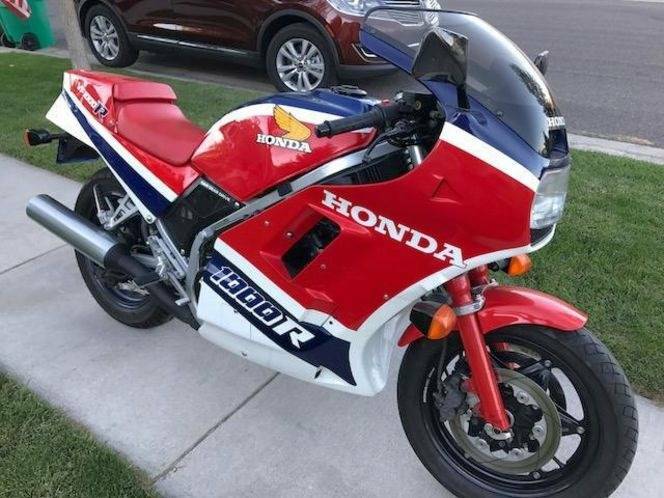 Could you provide more information about this 1985 Honda VF1000R INTERCEPTOR VF 1000 R? I just rolled 12K miles on this pristine Honda VF1000R--(yes, I ride it!). Collector grade, excellent condition, maintained, perfect running condition. New tires. All wear items like the fork seals, brakes, chain and sprockets are excellent. The bike runs and drives like new in every way. I do have some after market slip-ons that come with the bike. Cowl included. I believe the seat cover to be original and it is soft and pliant with no years. The paint is excellent. No dings, dents or scratches. Flaws: this bike is not perfect, but it is pretty darn close. As with all the bikes I have sold from my collection this year, there will be no test drives and no exceptions. If you buy it and then discover that this bike is less than what I have described (mechanically perfect), I will give you your money back within 10 minutes of your purchase so long as you have not damaged the bike in any way. Clean trades of just about anything are always welcome. (I am currently looking for a GPZ750 turbo or any early Japanese turbo bike). Please call or text anytime to set up an appointment, Adam at 208-406-8968. Thank you for looking and enjoy the pics!! What is the price of the 1985 Honda VF1000R INTERCEPTOR VF 1000 R you have in your inventory? What is the mileage of the 1985 Honda VF1000R INTERCEPTOR VF 1000 R you have in your inventory? I was wondering if this 1985 Honda VF1000R INTERCEPTOR VF 1000 R is still available?